I’ve finally gotten some real traction on my Robo-Magellan robot. 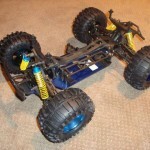 The picture here shows the chassis I purchased from eBay for a platform to get started. Actually I bought two of them, as I really want to have independent steering in the front and back. My plan was to chop the chassis in half, simply “glueing” one front end to the other front end. Now that I’ve had a look at how its put together I’ve got a slightly different plan, to make better use of the way the motor is connected. 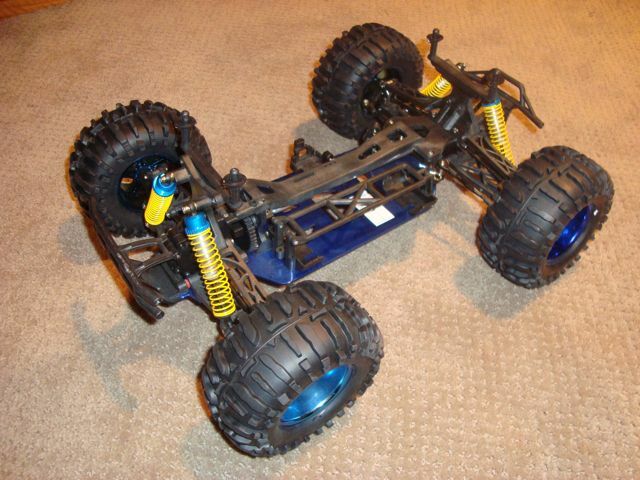 I can combine the back transmission and motor mount with the front axle pretty easily, without loosing much flexibility. It looks like I’ll be able to get independent four-wheel steering out of it too. I need to machine a new base plate, but I was pretty much expecting to do that anyways. The next thing to do is select a “brain”. I’ve got plenty of sensors and motor controllers, but nothing that will give me a “real” platform for software development. The AVR processors are simply too underpowered for this sort of job, and the Tin Can Tools Hammer board I’ve been playing with recently doesn’t have enough I/O. I really want something that can run Linux, preferably also run Python for the main program. I could write it all in C++ but the development time can be reduced by using Python. Anyone else building a Robo-Magellan robot? Last weekend I travelled to Seattle for Robothon 2009. Eileen went with me although she spent Friday and Saturday at the Emerald City Writers Conference. Why she would prefer to hang out with a bunch of authors instead of a bunch of geeks is a question you can probably answer for yourself. Unlike 2007, this year’s event was a bit more subdued. The Seattle Robotics Society didn’t hold the event in 2008 due to a lack of enough volunteers to run the event. 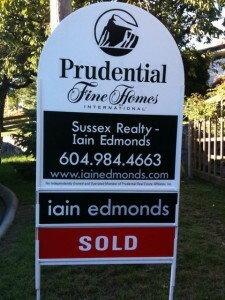 I’d expected this year to see a big resurgence in interest but it didn’t happen. I hope the people that did get out to the event had fun though, I certainly did. The only event I participated in this year was Minisumo, with The Thin Man. I’ve been too busy at work to have time to build new robots, and since we were cleaning our house up (to sell it, after buying another house) I had to pack away my workshop. If you recall, The Thin Man placed first in the 2007 event but this year was a different story: two straight losses and I was out. The Thin Man is no longer the “state of the art” in terms of building that it used to be, and its showing its age. The victors this year in Minisumo were students from Mexico with extremely nice robots. I was busy at the event even though I wasn’t competing. I volunteered to organize this year’s Robo-Magellan contest, an outdoor navigation event where robots have to drive around the park at Seattle Center to locate orange traffic cones. Fastest robot to go from the starting position to the ending position wins. It is really a nifty event, requiring robots of more sophistication than some of the more “classic” games like Minisumo or Line Maze. I’m really intrigued with this event and have started to get organized to build a robot with a hope to enter the event next year. More on this project in an upcoming post. 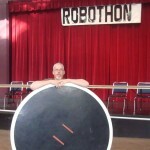 One of the more noticeable things about this year’s Robothon was the lack of participation. There were probably just as many people watching as in past years, but the number of competitors, particularly from the Seattle Robotics Society membership, was down. There have been a number of discussions online about this phenomenon, its not just something in Seattle but happening in many places and its been happening for a while. The number of explanations offered in these discussions outnumbers the participants and I don’t think there is any agreement about the root cause. I’m convinced its not temporary, but instead signals a need for a radical change in the structure of events like Robothon and maybe even how the hobby robotics “industry” (clubs, groups, etc.) is organized. This includes the Vancouver Robotics Club which I’m one of the organizers for. I did manage to take about fifty pictures while I was at Robothon, mostly the Robo-Magellan event and a handful of random other things.